This is not a restaurant review. I'm not tagging it as such. 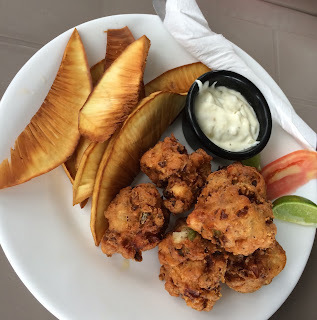 I can't review this meal in Yelapa objectively. For one thing, I indirectly had a hand in the making of maybe the best dish of the night. For another, the gathering I was with was clearly a bunch of the better known foodies of Houston, and thus, was interacting subjectively with the staff and proprietors of the restaurant. So, that said: it's good. In a city rife with TexMex and admonitions to "authentic" Mexican cuisine, this place manages to pay homage to Mexican cooking, without being TexMex or Mexican. Mexico is the inspiration, but the execution is experimental new American. Which matches the pricing - these are not taqueria pricing. Aside from the food, I must pay kudos to the service - they are obviously staffed with people trying to cultivate regulars - they try their best to remember names and faces, and to take the extra step to be proud of the dining experience. That's an intangible that is worthy of mention. As for the food - the most successful dish of the night isn't even on the menu: I brought the chef a gift of a bag of calamansi, which he served thinly sliced with chiles on cured escolar along with white and black beans. The escolar itself was cured like bacon, and it worked well with the fatty fish. The aromatic acid from the calamansi fruit, rind and all, was a wonderful counterpoint. One of the things that I was most excited about is are a series of non-alcoholic "cocktails" on the menu: I tried two of them - a ginger based drink and another based on prickly pear. Both of them came across as being very sweet, and, disappointing in lacking complexity. I wish I could recommend them - but not as they are. I noticed that almost the dishes I tried involved the brave use of some kind of sweet component in the preparation - this is unusual for Mexican (or in this case, Mexican-inspired) cooking. The "carnitas" are crispy smoked and cured pork belly cubes served atop a shredded green papaya salad (itself hiding small flavor grenades of house made tamarind candy). But it needed some kind of starch vehicle - a tortilla, perhaps? Quite a bit less successful is the "real guacamole panzanella", which was, indeed, more panzanella than guacamole. Essentially a fruity bread salad that used thick tortilla chips as bread, and incorporating avocado and watermelon radish in the preparation. Unfortunately, the chips don't soak up dressing as regular stale bread does in a panzanella, which results in the dish tasting oily as the sweetish vinaigrette separated on standing. My dining companion, the knowledgeable food explorer Jay Francis, suggested that it would have been better served by using bolillo bread as its base rather than the chip, thus preserving the Mexican inspiration while still executing it as a more conventional panzanella. I explored some of what could be the strongest parts of the restaurants repertoire, which are raw fish dishes, cebiches and traditos. These also tended to incorporate sweeter profiles by a generous of fruit like apples, but the restrained use of acid, and the thicker fish cuts result in a less than aggressive flavor. A very young restaurant, Yelapa is a pretty unique concept, and has an excited and proud staff behind it. A dining experience there is enjoyable, and I've no doubt that they take all responses with aplomb. I wish them great success, and look forward to the menu maturing.